A third railway station in Sutton, Sutton Park Station, was built by the Midland Railway. I t opened on July the first 1879. A contemporary guidebook to Sutton Coldfield describes the journey from Birmingham to Sutton Coldfield along the Midland Railway through Saltley and Castle Bromwich on the main line, then branching off to follow the E Brook valley towards Sutton. This was still pleasant rural countryside as the line passed above Penns Lake and across the brook, then climbing past Lower Maney Farm up the gradient to Sutton. Access from the station to the town was up a driveway to Upper Clifton Road, or there were footpaths to Anchorage Road and Mulroy Road. Trains from Birmingham drew into the platform on the town side, while passengers for Birmingham had to cross to the other platform by a footbridge. The station had a goods yard with five sidings, cattle pens, goods offices and a goods shed (there were no goods facilities at the other station on the Midland Line, Sutton Town). In 1895, in addition to numerous freight trains, there were eleven passenger trains each way, running between Birmingham and Wolverhampton, and twelve each way in 1920, terminating at Walsall. At the time there was a choice of stations on the Midland line - if you were going to Walsall it was cheaper to depart from Sutton Park Station, but the fare from Sutton Town to Birmingham was less than from Sutton Park. In 1923 the Midland Railway was absorbed by the London Midland and Scottish Railway Co., and this company closed Sutton Town station in 1925, making Sutton Park the main station for Sutton on this line. There were still trains every hour in the 1930s, but a number of trains from Walsall terminated at Sutton Park - in the 1950s the Sunday timetable consisted of a train going back and forth between Walsall and Sutton Park. No doubt Sutton Park was a popular destination for the people of Walsall and Aldridge, only a fifteen minute journey away. In 1955 Sutton Park Station was thronged with scouts attending the World Jamboree in Sutton Park; it had been equally busy forty years earlier when army recruits were training in the Park. 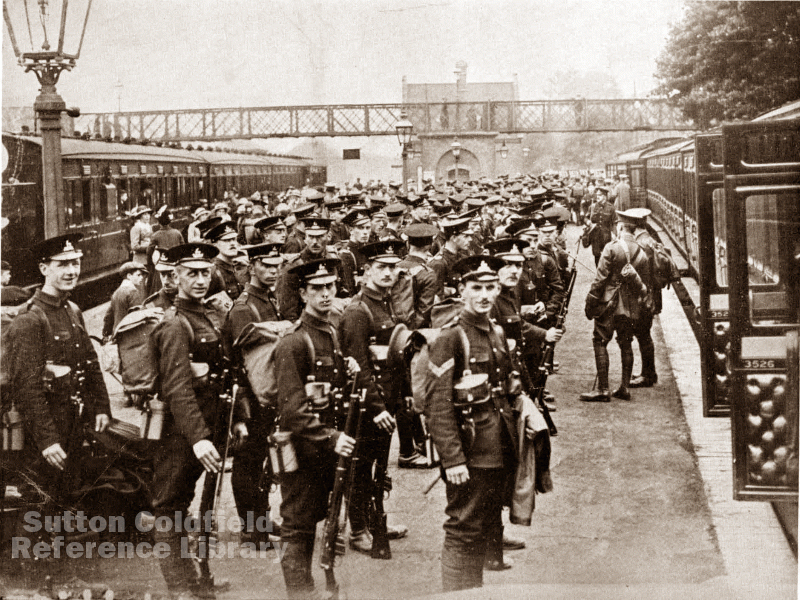 The troops embarked at Sutton Park Station for their new quarters in Yorkshire on 24th and 25th June 1915. In the Second World War the station yard was converted into a huge post office, and used as the first base sorting office for all mail to US troops in Europe. Railway services all over the country were being curtailed in the 1960s, and passenger services on the Sutton Park line ceased in January 1965. The station buildings fell into disrepair, and were demolished in 1999. 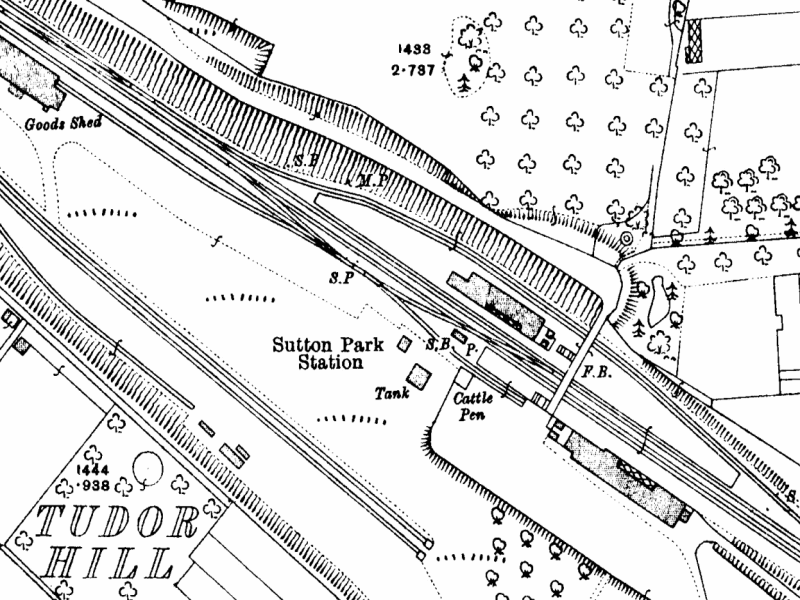 Plan of Sutton Park Station in 1913.